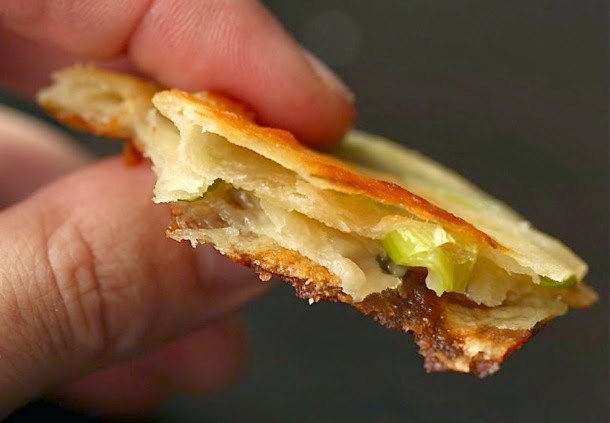 Cong you bing aka Chinese scallion pancake is a savory, non-leaven bread made by folding chopped scallions in dough, flattening it and pan grilled until golden brown. There are a few different types of savory Chinese pancakes unlike a true pancake, these are made with dough instead of batter. One of these, and probably most popular is “Cong You Bing” aka “green onion or scallion pancake” the other type of pancake are “Dan bing” a soft tortilla like pancake which is filled with a thin green egg omelet "Fa mian bing" is yeast-risen bing, "Laobing" is pan-fried bing, and so on. 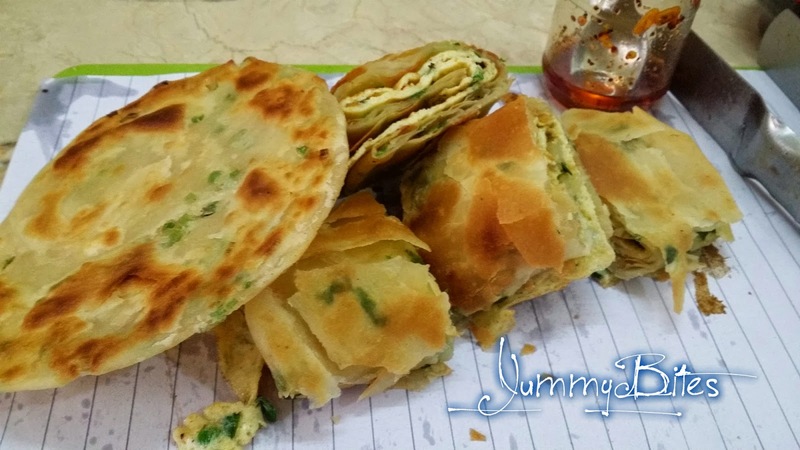 Cong you bing is not limited to green onion filling only but other ingredients, such as chopped fennel greens and sesame seeds are sometimes added with the green onions or garlic chives pancakes rather then green onion called "Jiucai you bing". To explain it, “bing” is bread or to join in Mandarin Chinese, qualified by the preceding words which tell just sort of bing it is. Since most Chinese homes had only a rudimentary kitchen or cooked outdoors over an open fire, the type of breads they make reflect this. Savory bread rounds leavened with baking powder are often baked on griddles over an open fire, and are assertively seasoned with scallions, garlic, lots of sesame seeds, or peppercorns. The culinary art savory bread began in China hundreds of years ago. Some believe that it started along the Silk Road at tea houses where travelers often stopped to relax and eat, which is where Marco Polo got a taste of the eastern culinary mainstay. There is a old story in a humorous Chinese newspaper article, that pizza is an evolution of the scallion pancake, brought back to Italy by Marco Polo that also includes Marco Polo inventing cheese fondue when he is lost in the Alps and wants to eat Chinese hotpot. Well, this simpler food has very complex and interesting evolution in the history of Chinese cuisine. The traditional way of serving this, from what I have read is simply pan grilling the dough and served it with some chili and soy sauce. But in the documentary Exploring China the hostess served it with thin spring onion egg omelet rolled in Cong you bing, so I tried it the way I watched it to experience the same taste. If you take a look at the ingredients, it’s pretty basic no fancy ingredients required. I used just plain vegetable oil, but you could easily make this with sesame oil instead for more flavor. You could also use different fillings – try green garlic or garlic scape instead of green onion for a different twist. In a bowl, combine the flour and salt give it a quick whisk to combine everything. Make a well at the center of the flour mixture. Pour the hot water into the center of the flour mixture. Using a fork, mix until everything comes together. If the dough becomes too sticky, simply use your hands but be sure the dough is at workable temperature. Turn the dough out on a floured surface and knead for a few minutes until you have a nice smooth ball of dough. Place the dough in a bowl, cover the bowl with a damp cloth/towel, and let the dough rest for about 30 minutes. There are two technique for shaping the flat bread for unique layering (see the photo and follow the instructions carefully), but very easy. The first is the flatten the dough ball with rolling pin, grease with oil, sprinkling the scallions and then mark 6 cuts from the edge inward but neither letting the two opposite cuts to join nor any of them with each other. Fold the triangular cut edges in the center stacking on one another, then rolled out flat disk with a rolling pin before laying in the hot pan to cook. 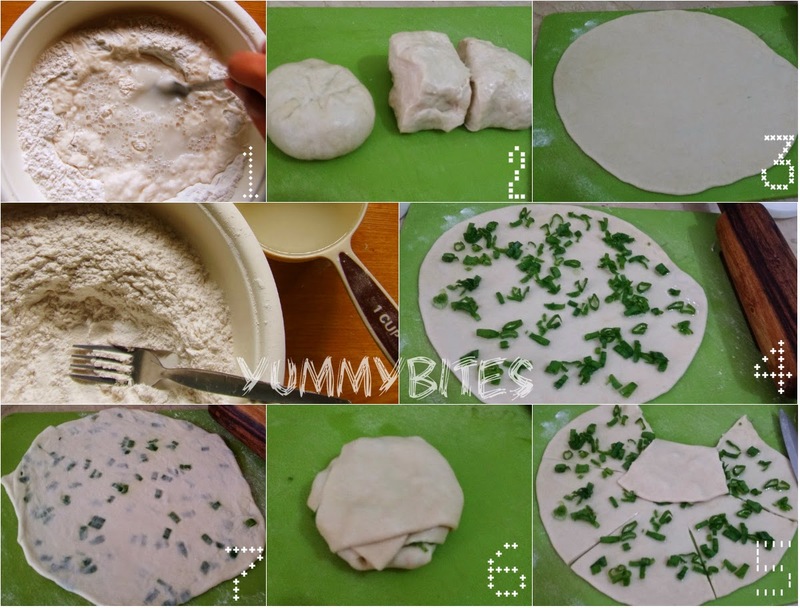 While the other method is little bit different click here to check the Chinese scallion pancake wrapping method 2 Complete the rest of the dough in the same manner, either way you like and is comfortable to follow. Cover the pancake with a clean cloth towel while you are working with the rest of the dough. Heat up a flat griddle pan or tava with some oil. I didn't use much. However, you will get a uniform golden colour if you use a somewhat generous amount of oil. Fry the pancakes till both sides turn a light brown. It is important to flip them over frequently. Don't wait for one side to get done completely before flipping it. Otherwise the pancakes would turn a bit hard. Beat eggs, salt, white pepper and chopped scallions. Fry in to thin sheet, about quarter of a centimeter. Don't let the omelet to be over cooked. Place the pancake on an absorbent paper and wait till the excess oil to absorbed by the paper. Even though both the side are crispy but place the more crisper side out, lay the cooked omelet over the pancake, sprinkle few drops of chili oil and soy sauce. Roll it, you can see the crispiness of the flat bread. Cut and serve hot with garlic-soy sauce or spring onion-soy sauce.